Helping Assist Nepal’s Disabled (H.A.N.D.) is a U.S. based 501(c)3 non-profit organization, registered in Oregon. Our mission is to serve the Nepali people who suffer from disabilities of all types. We have a special mission to help the children of parents with disabilities, as they are the future of Nepal. In 2013, while working on a project with children living in the Shanti Sewa Leprosy/Disability home in Kathmandu Nepal, we met Dirgha who lives at Shanti Sewa. 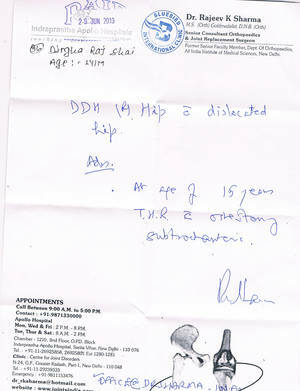 Dirgha is a 15 year old Nepali boy, born with hip dysplasia. Dirgha is a very friendly boy who works hard in school and has a good command of English as a second language. During our visit he offered to give us a tour of the facilities so that he could practice his English. We noticed right away that Dirgha walked with a severe limp while keeping his left arm behind his back for balance. Since H.A.N.D.’s mission is to help Nepali children with disabilities, we asked him if he knew why he walked this way. He was not sure. He thought that maybe he had been dropped as a baby or an injection had caused it. We suspected hip dysplasia and offered to take him in for x-rays. Dirgha jumped at the idea as nobody had ever spent much time with him. He lives in a small room with five other disabled boys. Over the next month we learned all about Dirgha’s short life. He was born in the remote Mugu region, high in the Himalaya in Nepal, near the Tibetan border. His dad died when he was three years old. Life in a remote village is difficult as there are no roads, only trails. By age seven his mother could no longer care for him as walking in the mountainous terrain was too difficult. She is extremely poor and has no education. She brought him to Kathmandu where she dropped him off at Shanti Sewa Leprosy/Disability Home who agreed to give him a small shared room, food and a basic education. He has not seen his mother for now for eight years as the two-day walk from the end of the road to her village is far too difficult for him, and she is too poor to make the trip to Kathmandu by bus to visit him. After getting Dirgha x-rayed, his hip dysplasia was confirmed as the reason for his difficulty walking. He also suffers from severe back pain because of the four inch difference in the length of his legs. We took him to every orthopedic center in Kathmandu, but we were told that the surgery he needed for a hip socket re-build and an artificial hip was not possible in Nepal. The best that they could do was to fuse his hip. We were told that Dr. Sharma from Apollo Hospital in New Delhi, India was going to be in Kathmandu briefly so we made arrangements for an exam with Dr. Sharma. Dr. Sharma told us that Dirgha is an excellent candidate for a hip replacement and he feels that Dirgha will be 100% mobile for the first time in his life. Since Dirgha reached the age of 15, he is ready for his life-changing surgery. Life in Nepal is difficult as more than 50% of the country lives in extreme poverty with a median income of about $700 USD per year. Nepal is listed as the poorest country in Asia, and amongst the poorest in the world. Typical work in Nepal involves heavy manual labor that is impossible for a boy with hip dysplasia who already has a difficult time with limited mobility for his basic needs. It is estimated that Dirgha will be wheelchair-bound in his 20’s and will not live a long or productive life if there is no intervention. Dirgha is a hard worker in school and a very smart boy. 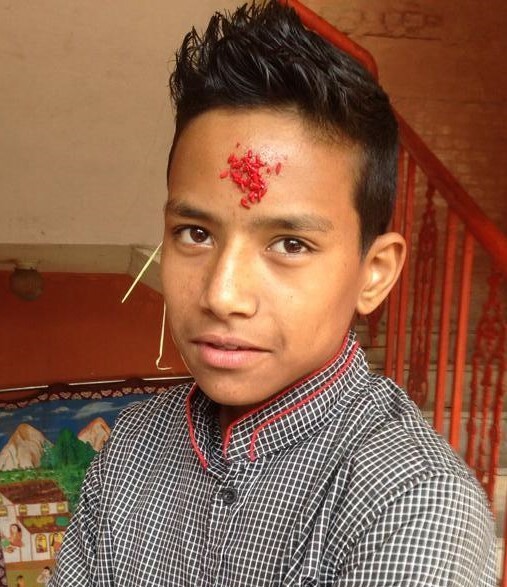 His dream, if given an opportunity is to become a doctor so that he can help other disabled children in Nepal. With outside help for both a higher education and a hip replacement, we believe that Dirgha will achieve his dream and be part of the solution to make Nepal a better country for future generations. His critical first step is a hip replacement. Any donation made through H.A.N.D. is tax deductible. 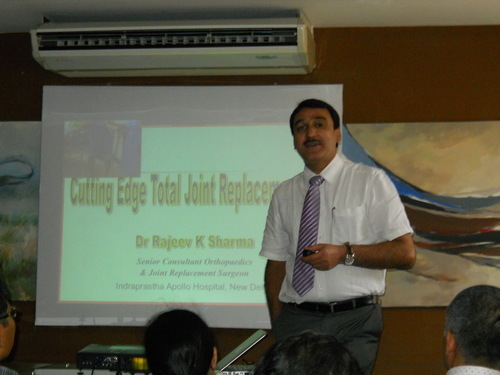 A significant portion of the $9700 estimate from Apollo Hospital is the cost of the hip implant. In addition to transportation to India, surgery cost overruns and post-surgery physical therapy we are estimating about $14,000 in total costs. Click on the photos above for more photos of Dirgha.